A hardworking blend of botanical cleansers, lavender essential oil, calendula, and vitamin E, known for their moisturising and healing properties, cleanse and nourish even extra dry hands with every wash. Gentle enough for frequent hand washing. Aloe Barbadensis Leaf Juice(1), Coco-Glucoside, Aqua (Water), Sodium Coco-Sulfate, Decyl Glucoside, Sorbitol, Glyceryl Oleate, Citrus Aurantifolia (Lime) Oil, Citrus Limon (Lemon) Peel Oil, Lavandula Angustifolia (Lavender) Oil, Calendula Officinalis Flower Extract(1), Chamomilla Recutita (Matricaria) Flower Extract(1), Chenopodium Quinoa Seed(1), Lavandula Angustifolia (Lavender) Flower/Leaf/Stem Extract(1), Tocopheryl Acetate, Bisabolol, Citric Acid, Glycerin(1), Sodium Sulfate, Alcohol(1), Benzyl Alcohol, Potassium Sorbate, Sodium Benzoate, Coumarin, Limonene, Linalool. Working into a rich, moisturising lather and rinsing will provide hands with a complete clean. 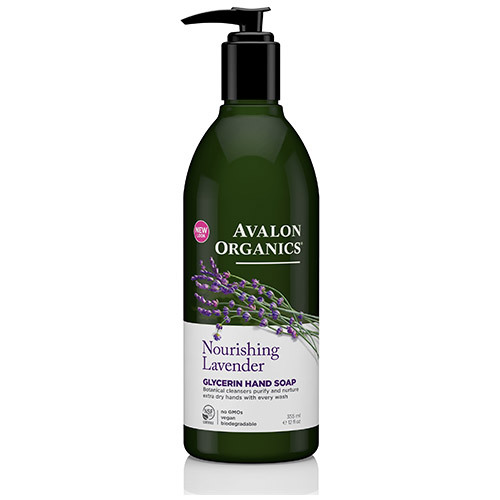 Below are reviews of Avalon Nourishing Lavender Glycerin Hand Soap - 355ml by bodykind customers. If you have tried this product we'd love to hear what you think so please leave a review.